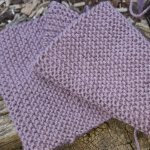 If you have now learned how to do knit stitches, the next step is to learn how to purl stitches. 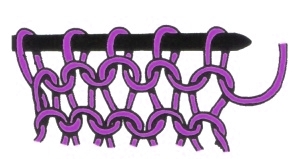 To learn how to do purl stitches, you need two single pointed needles and a ball of wool. and as with learning how to form knit stitches, you will either need to learn how to cast on your stitches or have someone else do it for you. Holding the yarn at the front of the work, push the needle in your right hand through the front of the first stitch on the left hand needle. With your right hand wind the yarn around the right needle from the back of the needle to the front. Using the needle in your right hand, draw the yarn through the stitch on the left hand needle. Slip the stitch off the needle in your left hand. You should now have a new stitch on the needle in your right hand. Now you just repeat each of the steps from one to four for each stitch until you have completed the row. When you are finished your knitting should look something like this. For a printable PDF copy of thisTutorial just click on this link. Want to See How to Purl a Stitch? Check out this video demonstration! If you want a smooth viewing experience, I suggest that you hit the pause button for a while so that it fully loads before you watch it.